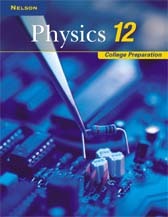 Nelson Physics 12 College Prep Text and all Handout Solutions available from here. Unit outlines & Unit Specific Links. Here you will find an approximate outline of the material we will be covering for each unit. Use this information to read ahead or catch up if you are away. Explorelearning has science Gizmos that are designed very well. Use the code given to you in class for your section and register. Need help registering? Remember to check out the exploration guide for each Gizmo. These must be completed by the end of each unit. Quizme BC - this site can provide you with random quizzes to see if you are doing ok. Choose your course and unit, then try some questions. Hyperphysics has a clickable 'mind-map' of all topics physics that you can use to find additional info on any topic that you need some extra help with. The Physics Classroom is an amazing resource that has tutorials and good clear explanations. Click on the Tutorials or the Multimedia Studio and you will find good clear info on all of our topics. St. Mary's Physics is a school in the states with some good information. Check out the videos and animation links at the top of their page. You will find some stuff for everything we do. Mr. Clintberg's StudyPhysics! has notes and other multimedia information. Filter through it and you will find some good notes to suppliment our class notes. Howstuffworks has tons of information. The image is linked to their videos. Go in and search the video database for any topic related to what we are doing at the time. You are sure to find a great explanation of the topic. If you find an excellent one, let me know and I will create a link to it directly. Check below for some specific links that I have found for each unit. If you find something that you think would be useful for your classmates, let me know and I will add it to our resources. The Moving Cow You might like this cow moving as well. There are some problems with a vi that is negative. v vs. t Graphs quiz Do this one as well to make sure you understand graphs! Graph Sketching and Recognition. From the 'Physics Classroom'. An absolute 'must do' to help with understanding graphs. Subtracting Two Vectors - It is just the addition of the negative. Can you 'Recognize the Forces'? From the 'Physics classroom. This activity has you determine if a Force is present or absent. Atwood's Machine Lab - here is the Excel file to check all your calculations from the lab. Elastic and Inelastic Collisions This allows you to see the effects of momentum and Ek during collisions. Do the 'AstroPitch'. Remember to do the quiz after you play. The Best Circular Motion Video Ever!! Why doesn't the moon fall down. A little video from PI. Artificial Gravity. Watch this video clip. Circular, Satellite and Rotational Motions. As explained from the Physics Classroom. There are some good animations that may help. Einstein Light. A great coverage of Relativity.